Put allspice, ginger, zest and cinnamon in 2 liters of water; add the sugar and bring just to a boil, stirring to dissolve the sugar. Remove from heat. Add the roselle and allow the mixture to steep covered for 20 minutes. Strain the syrup into a storage jar and add the lime juice. Store this in the refrigerator for up to three weeks. To serve, fill a glass with crushed ice, add the syrup to half fill the glass and top up with club soda. Agua de Jamaica is the classic version of an agua fresca, and certainly the easiest to make. The roselle is high in Vitamin C, and is tangy yet floral in character, almost like a berry or grape drink. The spices are subtle, and create background complexity. It can be prepared as a still beverage, or, as in this example, topped up with club soda to create a sparking (gaseosa) version. Refrescante y delicioso! 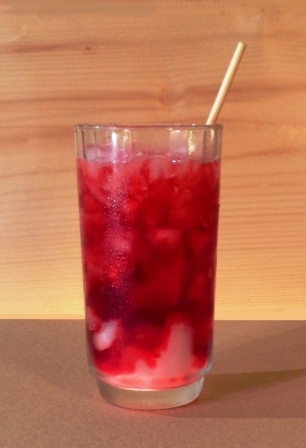 This entry was posted in soft drinks and tagged agua de jamaica recipe, agua fresca, fermentation, hibiscus soda, homebrewing, soft drink recipe, umami.